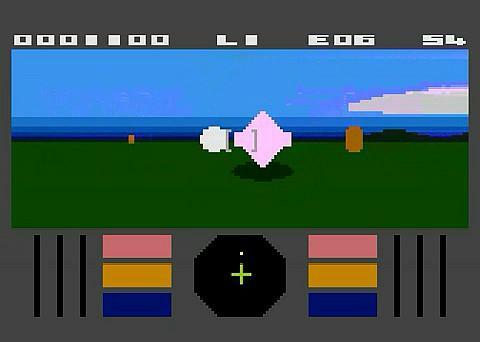 The above video features the Atari 8-bit version of Encounter. You will find the C64 version further down the page so you can compare the two versions. This was the very first of eight games to be produced by Novagen, a gaming company established by Paul Woakes and Bruce Jordan. Released in 1983, Encounter is an action-packed, 3D combat game which was among the first to feature full colour objects and scaled sprites, rather than wireframe (vector) graphics. 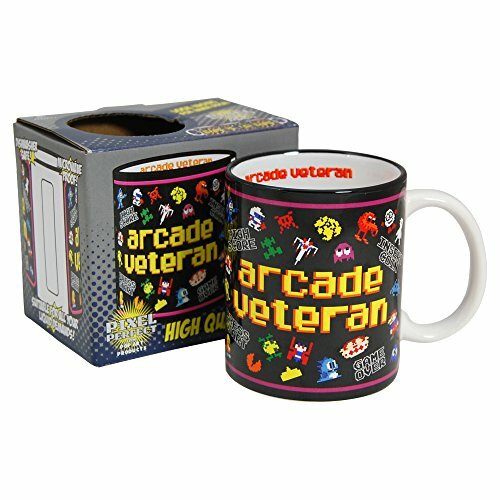 Indeed, many would argue that it plays like a colourful version of Battlezone. As with all of the Novagen games, it was programmed by Paul Woakes who had a great sense of imagination. What initially attracted me to the game was the 1950s style sci-fi artwork on the inlay card of the cassette case. It featured a pilot sat in a futuristic cockpit staring out at an alien world containing a shiny, metallic diamond-shaped UFO surrounded by golden obelisks. And yet, there was an earth-like landscape with blue skies, white fluffy clouds and a what looked like a mown lawn. It was very intriguing, and I just had to buy the game! The graphics in the game itself represented the artwork quite well, albeit in a jagged 8-bit style. Later levels featured different coloured landscapes which added to its appeal, and made the player feel like they were, perhaps, playing on a different planet each time. 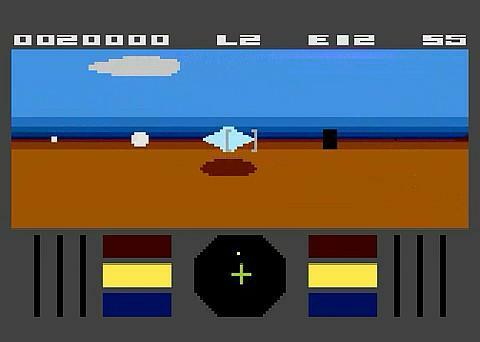 What I remember vividly about the game are the sci-fi sound effects which only the Atari's POKEY chip could create. For me, this was the definitive gaming soundchip and the most perfect for using in computer games. The sounds it generated added a unique and menacing atmosphere to the game, allowing you to immerse yourself in an 8-bit world that only the 80s could produce. Encounter featured eight different landscapes and three difficulty levels. There were two levels, the shooting level where you shoot at the diamond craft, and a flying level where you must fly through a 3D starfield avoiding contact with any asteroids. In the shooting level, there were also homing missiles which quickly moved towards you with an accompanying sound effect and red, flickering lights on the cockpit panel that really added a sense of urgency. Suddenly, you would find your self moving backwards at breakneck speed, praying that you didn't reverse into one of the obelisks. You also found yourself gripping the joystick with such force that I wonder how it ever survived the ordeal. This and the green alien in Rescue On Fractalus are the two most terrifying moments in gaming history - for me, at least! Another nice touch in the Atari version is how the sound of the alien craft gets louder as it approaches you, further enhancing the realism of the game. 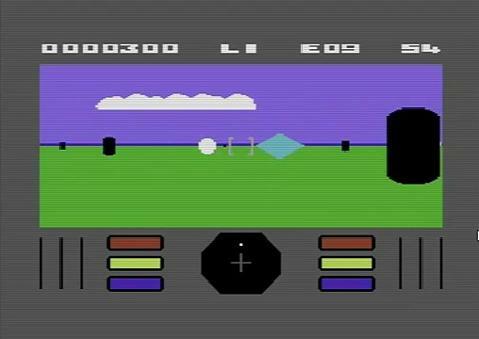 While the graphics may look smoother in the C64 version, the sound effects lack the punch of the Atari game. Nonetheless, Your Commodore magazine thought the game was worthy of 4 stars out of 5. 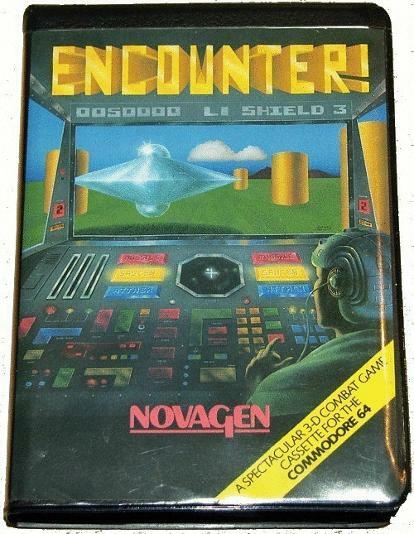 In the U.S., Encounter was published by Synapse, with Novagen publishing the game in Europe and the UK. The game was released for the Atari ST and Commodore Amiga 16 bit computers in 1991. The programming in the game was superb and the fact that you could also reverse into the obelisks and that missiles could bounce off them was intelligent programming for its time. The game played pretty smoothly which was not an easy task on those 8 bit machines. What I was really impressed by was when the diamond craft and homing missiles exploded they would shatter into diamond-shaped pieces that flew to the sides of the screen and sometimes towards you. This game was groundbreaking and ahead of its time, and I remember playing it for hours at a time, which is a sure sign that other gamers were, too, as I have a short attention span.